Lately I've been looking back over the past few years and trying to remind myself how far I've come, especially as a designer. As a recent college grad it can be incredibly discouraging to continuously receive rejection emails from companies. It's frustrating not being able to break into an industry that you spent the last 4 years learning the ins and out of. So every now and then I take a step back and look at where I was just 3 years ago. To be honest, 3 years ago I wouldn't have even called myself a designer. I was a student and completely incompetent when it came to design. I had changed my major after my first semester and barely got my feet wet in the design department my first year. I spent that first summer out of school watching youtube tutorials and fumbling my way through Illustrator. I don't think I was very successful at teaching myself so shoutout to art school. I found this photo on my computer the other day of my first attempt at logo design (its not even a saved file because of 1. how bad it is and 2. I don't think I even knew what a JPEG was). It's pretty terrible, I know but thats exactly where I was in my design career 3 YEARS ago!! That's crazy to me. When I went back to school my second year I was ready to hit the ground running. I knew I had a lot to learn and I was excited to learn it. I didn't quite understand how much time I would spend "learning how to be a designer" before I was actually at a place where I was able to design with creative freedom. But I'll never forget that feeling when my work went from just trying to meet the requirements of a project to actually executing creative ideas. Fast forward a few years, I took another stab at that logo. I laugh because I've come so much further in those years than I give myself credit for sometimes. Even though post grad life has been tough, I've gotta believe that I'm tougher. If I can go from having absolutely no idea what I'm doing to actually making money as designer in just a few years, I can only imagine how much more I'll grow over the years to come. Did you know Doughnut Vault is one Chicago's top tourist attractions? So you probably wouldn't expect them to have a 100 square foot store front to sell their hand crafted treats, right? This discovery sparked my interest in this little company that led me to redesign everything from their logo, to coffee cups and even creating a brand standards manual. I spent 15 weeks working with Doughnut Vault's brand for a semester rebranding project. I wanted to create an identity for them that was recognizable and could be expanded as the company grows. The process began with preliminary research about the company's history and current identity. What I found was they pride themselves on the simplicity and authenticity of their brand. I used this as the foundation of my creative process as I explored design solutions. The first, and probably the most important, component of the brand I explore was the logo. The current logo is very simple and does not give much insight into the brand, other than its name. In my research I discovered the name "Doughnut Vault" originated from the architectural elements on the companies original Franklin St. location. I looked into the architectural structure of these vaults and found that they emulated the same curved shape as a doughnut. I decided to explore how the doughnut, or rather half of a doughnut could be used to reflect the architectural style of these vaults. After establishing the style direction of the logo, I began to play with how the type could interact with the mark. I liked the idea of the type in relation to the mark creating the shape of the vault somewhat organically. But I struggled to find a typeface that could do this and still fit the style of the mark. Eventually, I stumbled upon a typeface that I felt was most reflective of the brand and was able to settle on a final logo design. After the logo was solidified, it was time to start applying it. I started by creating a stationery system including: business cards, letter head and envelopes. The stationery was where the addition of the sprinkle pattern was introduced. From there, I developed a series of collateral items including: uniforms, packaging, souvenirs and more. 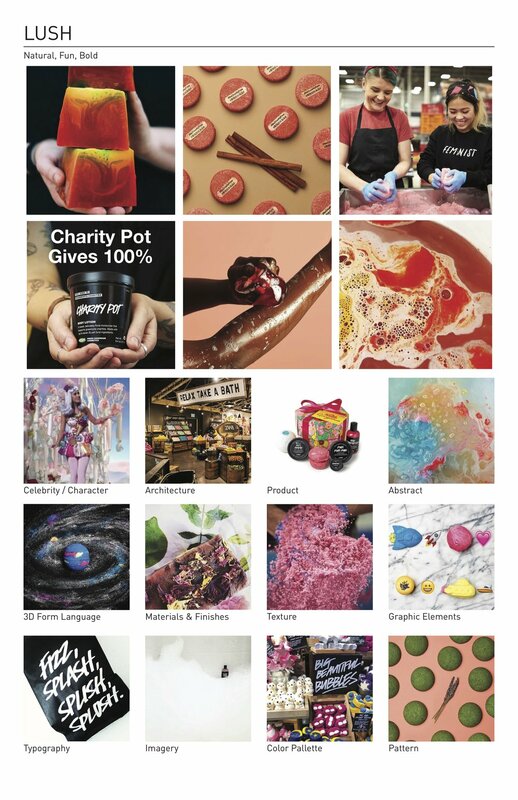 With these different applications, I was able to explore how the logo could be used as separate elements as well as discovered other visual elements to use throughout the brand. My favorite part of this project, was creating the style guide. The guide consists of 30 pages of guidelines and examples of how to use the logo, typography and overall revised brand. It also features photography from the original Doughnut Vault location. 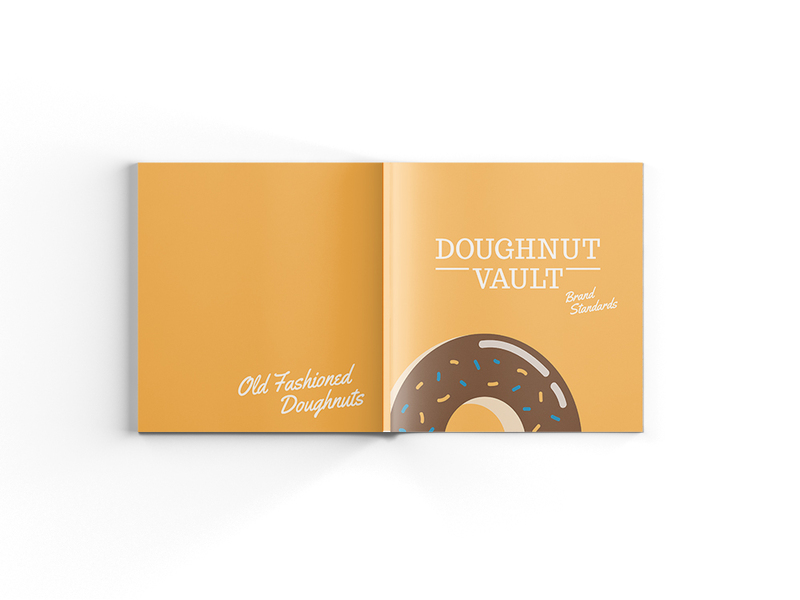 The final guide was printed as an 8" by 8" full color booklet and displays the new Doughnut Vault brand in all its glory. To see samples of the final brand identity, click here. 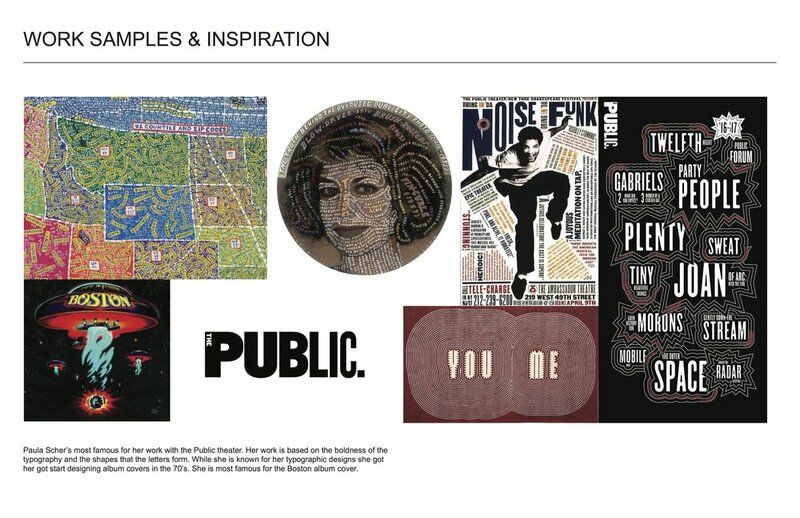 If you've been in the design world long enough you've probably heard of Paula Scher or at least seen her work. Paula's work has left its mark all over New York City. From Citi Bank to the Public Theatre, her bold designs are around every corner. Paula's creative expression was the inspiration for this project. After exploring her work and learning more about Paula's personality, I decided to honor her with a sweet treat: Scherbet. The process of this project began with an exploration of Paula's work and personality. After watching the Netflix original Abstract, which features an episode following Scher's life as a designer, I was able to grasp a better understanding of her. I then turned to the internet to find samples of her designs and articles honoring her work. I used this to develop a concept that was inspired by her life and honestly a perfect play on words. The piece that specifically inspired my designs was the Public Theatre's 2016-2017 season graphics, which can be seen above on the far right. The designs feature Paula's famous style of incorporating bold type in fun and unique ways. I used the shapes and the elements of white and color on a black background as the basis for my designs. I picked an ice cream container because I thought it could be an interesting exploration of how type and form could interact. The name Scherbet just came naturally as I began to develop the concept. I loved the idea of incorporating Paula's designs but also creating something that I felt reflected her as a designer. In my final design solution, I wanted to use the starburst shape as the main element, accompanied by the bold typography. I tried to explore how the typography could work in relation to the the graphic elements. I felt that using black as the background was an effective way to allow those elements to stand out. To see the final renderings of Paula Scherbet, click here.